ANNE EICKSTADT PHOTOS Belvidere Daily RepublicanWhen it is time to set the roof trusses in place, it takes every volunteer plus the extra muscle and sure feet the Belvidere Fire Dept. sends in to get the job done. “We are all about building communities. We do not give away houses,” said Kim Mickey, executive director of Habitat for Humanity of Boone County. “The recipients pay a mortgage of about $500 to $600 per month. They must put in 300 ‘sweat-equity’ hours on-site at the house, helping at fund-raisers, in the office, etc. “We built our first house on Menomonie St. in 2006 in partnership with Rockford Habitat for Humanity. In 2007, we became our own affiliate. So far, we have built eight houses. Some years we did not build simply because we did not have a lot to build on. “To be considered for a house from Habitat for Humanity, the family has to take courses in financial management, home maintenance and repair, insurance, and security. Their application will be chosen by anonymous vote – all names, job employment information, etc. will be removed before the selection committee sees it. The selection is made by their criteria alone. “Having a house gives people hope. It transforms their lives and gives them a home. That same hope has proven that the new owner’s children are more likely to go to college. 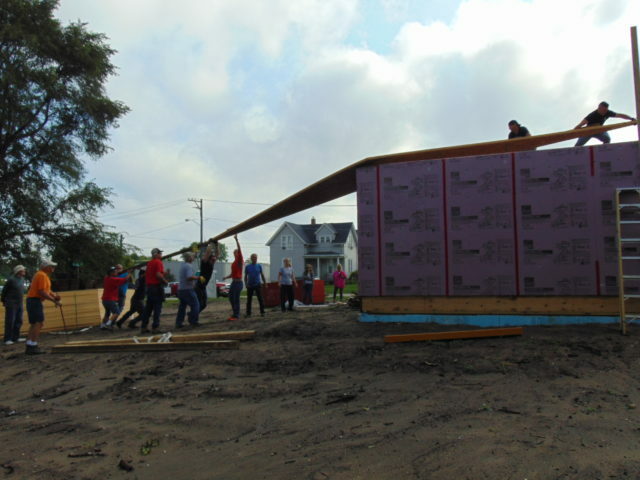 “We are currently building a house for the Vincent family on Gilman St. It is right across the street from the house we built last year. The dedicated men helping the Habitat for Humanity family are joined by Fire Chief Hyser in putting up the interior walls of the house. work on Tuesdays, Thursdays, and Saturdays. The Vincent family has a daughter in a wheelchair. The wheelchair does not fit through the doors of the house they are currently living in. They have to pick her up to get her into the house, take her to the washroom, etc. “A typical house for us has 1000 square feet, one bathroom, a covered front entrance, and four foot wide hallways for wheelchair accessibility and we are currently looking into the possibility of rehabbing houses. 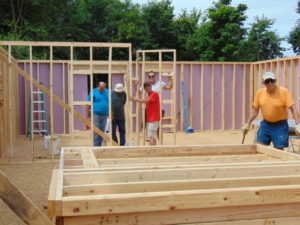 “We have numerous volunteer opportunities as board members, to sit on committees, and to work with a crew on building houses. We need to build a larger volunteer base, including skilled labor. We have a couple of people who work on grant writing for us. The Alpine/Midland Bank works with us with mortgages to give families opportunities they would not have had before. “Construction depends on the weather and when skilled labor can come in. 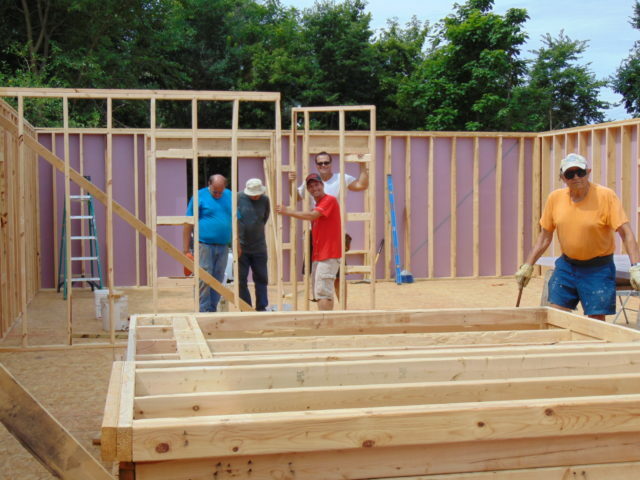 Once the foundation is poured, electricians and plumbers have to come in. We work around their schedule because they volunteer also. 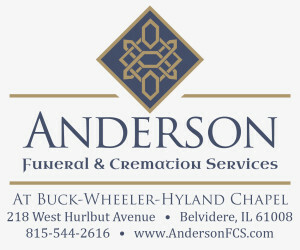 “We accept cash, gifts in kind, construction services, building materials, and landscaping. Window World just donated 12 windows for our house. For complete article, pick up the Aug. 1 BDR.